Sometimes when you’re entering information into a worksheet, Excel automatically formats it in a way you didn’t intend. 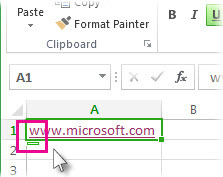 For example, if you type a web address, Excel will turn it into a hyperlink. This can be really helpful, but there might be times when that’s not what you want. In that case, you can turn off automatic formatting for one cell or your whole workbook. Move your mouse pointer over the text that was just automatically formatted, and then click the AutoCorrect Options button that appears. This button is tiny, so look closely as you move the mouse pointer. To remove the formatting for just the text you’ve selected, click Undo. For example, if Excel automatically created a hyperlink and you want to remove it, click Undo Hyperlink. To tell Excel to stop applying this particular type of formatting to your workbook, click Stop. For example, if Excel automatically created a hyperlink and you want to prevent Excel from doing that for the rest of the worksheet, click Stop Automatically Creating Hyperlinks. If you want to review and change automatic formatting options all at once, you can do that in the AutoCorrect dialog box. In the Excel Options box, click Proofing > AutoCorrect Options. On the AutoFormat As You Type tab, check the boxes for the auto formatting you want to use. Internet and network paths with hyperlinks : Replaces typed URLs, network paths, and email addresses with hyperlinks. Include new rows and columns in table : When you enter data below or next to an Excel table, it expands the table to include the new data. For example, if you have a table in columns A and B, and you enter data in column C, Excel will automatically format column C as part of your table. Fill formulas in tables to create calculated columns : Applies one formula to all cells in an Excel table column. Note: If you want to set how numbers and dates appear, you do that on the Home tab in the Number group. It isn’t part of automatic formatting. If you have the Excel desktop application, you can use the Open in Excel button to open the workbook and undo automatic formatting.